One of golf’s most famous and celebrated holes in the world, the 17th St Andrews hole, the Road Hole, will be lengthened by 35 yards, to 490 yards. Work will begin this week and a new tee will be built on a driving range nearby. For years the Road Hole has been considered by many great players as one of the hardest par 4’s in the world. Its uniqueness includes a tee shot played over a building, a road that is in play immediately behind the green, a greenside pot bunker that doesn’t easily give up ball or player, and a green that slopes into that same bunker (also called the Sands of Nakajima). Over the years the Road Hole has claimed many victims such as David Duval in the British Open in 2000. Being in 2nd place behind Tiger Woods he ran his ball in the bunker, took four increasingly feverish shots to get out and ended the hole with 8. Besides losing his dignity and a considerable amount of money, he also swapped 2nd place for tied 11th. So why change it? Clearly next year’s British Open is a major catalyst. According to Royal &Ancient chief executive Peter Dawson, the Road Hole has become too easy and no longer plays the way it was originally intended. The threat from both the road and the bunker has diminished now that players use shorter irons for their approach shots. 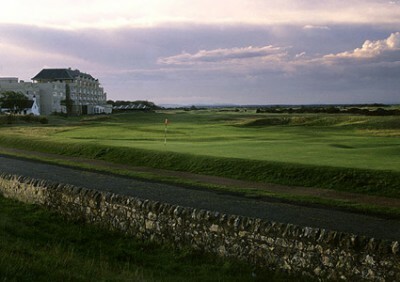 Ironically it is the R&A who has the reputation of being one of the guardians of the game’s tradition. Undoubtedly cricticism will erupt and I fear I am amongst this bunch. Yes I agree that the hole may have become easier to some as both athletic abilities and particularly equipment have improved. Nevertheless and in spite of this the Road Hole never has become easy, certainly into the wind when it is difficult to reach in two. It’s all back to the chicken and egg discussion I reckon. Should holes and even courses be reconstructed each time that improved equipment is leading to increased yardage, or should we just change the rules for equipment? Again ironically some of the equipment rules are to be changed in 2010; most club heads will have smaller grooves in an attempt to reward accuracy off the tee and rein in golf’s power-hitters. Moreover it will become more difficult to hit the green. Golf’s major stars also seem to disagree. Goossen prefers the current hole, Harrington wants to see it even more intimidating.